Ah cravings. I'm pretty good at not giving in to cravings. While I can justify eating a whole bag of cookies or half a pie, unless the object of the craving is in the house or easily accessible, I'm not going out of my way or making a special trip to get it. Today, I forgot lunch. I thought about it when I was getting ready for work, but never made it up to come with me. As luck would have it, I had a Campbell's ready to heat soup and the last of the instant pudding in the desk drawer. (Must restock this weekend with a trip to the grocery.) Going out was not appealing so having soup and pudding in the desk drawer was very convenient. But what to make for supper. It's one of those "I don't want to cook" weeks. I have gone through all my soup; all the instant flavored rice; all the freezer pasta I had left. I just did not feel like standing over the stove and swishing a spoon into something. I've finished off all the bread, cereal and peanut butter. I cleaned out the freezer on Wednesday, as I said I was going to do, and tossed stuff which just didn't look right. The grocery visit this weekend will be with an eye toward fresh and things which can be prepared quickly. Then the internal argument about needing to eat won't end with a shrug and a peanut butter sandwich. At 2 pm, I considered my options. I had Wendy's salad on Wednesday; Panera on Tuesday and Subway on Thursday. My usual route home does not take me by anything. This is to my betterment, of course; both my waistline and my pocketbook. I have the grocery list prepared. I am ready to hit the ground running tomorrow, but it's 2 pm on a Friday afternoon, and it's not the best pickings in the freezer or cupboards at home. What's there needs some elements of preparation and I'm too tired for that. Then I had a thought. I have not had Taco Bell in ages. No, it's not the best food on the planet. It's also slightly out of the way. It does, however, meet one criteria, it's inexpensive for what I get. If I could have put voice to the internal conversation, you would have laughed. The tired Deb just wanted to go home. The rational Deb acknowledged the tiredness, but said food is important. The larder would be restocked on Saturday. Tonight, I could indulge. Besides, I couldn't tell me when the last time was I walked into a Taco Bell and got food. I got my usual, which is 3 soft tacos and a drink. They have these balls of deep fried dough surrounding a custardy center and rolled in cinnamon sugar. Thank goodness I only got 2 of them. The flavor was of cinnamon sugar grease. Never buying that again. The tacos were their usual decent selves. It's not amazing food. It's steady and, like any other chain fast food restaurant, the same. Three soft tacos in Glen Ellyn are going to taste the same as three soft tacos in Warner Robins, Georgia. There are times when that is exactly what you want. Recommending Taco Bell food is kind of like recommending Oreos. Yeah, the stuff is okay once in awhile, but not all the time. There is one thing they have which I will recommend. 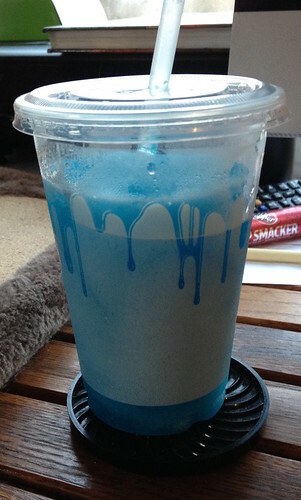 It's a blue raspberry "freeze". I like these kinds of drinks anyway. Call them Slurpees or Slushies or Freezes, they are finely shredded ice into which flavoring has been added. As the ice melts, you get the liquid beverage. They usually come in a dispenser machine. Taco Bell supposedly has strawberry flavor reminiscent of Starbursts but they were out of that flavor. So, I "settled" for blue raspberry. You know, it's $2.50 for this size; $3.15 for the large size. This size is plenty. If you like the weird taste of blue raspberry, this is very good. The thing with this is, now that I know I can get it via the drive-up, I don't have to go in and get food. I never had to but I don't like handing my debit card through the drive thru window where it's out of sight for a few minutes while they ring up the sale. I can cobble together $3.50 to have for this beverage. I won't get it regularly; it's not something I should be consuming regularly. But in the annals of comfort food, I've found a beverage which fits the bill.